YOUNGSTOWN, Ohio – On Wednesday, the Rotary Club of Youngstown celebrated the renovation of Wick Park Pavilion, but one of its members says she sees the work done so far as a “starting point” for more to be accomplished. Joined by Mayor Jamael Tito Brown, members of Youngstown City Council and representatives of donor organizations and contractors, Youngstown Rotary marked completion of the renovation work done at the pavilion, which was built in 1955. At the end of the formal program, which took place as part of club’s weekly meeting, officials cut a ceremonial ribbon on the project. The Rotary club undertook the pavilion renovation to mark its centennial in 2015, embarking on a “bold, fundraising campaign” for the project that spanned six presidents, said Scott Schulick, one of those past presidents and current district governor of Rotary District 6650, which covers 10 counties. The Youngstown club has raised about $350,000 – the single largest fundraising effort in its history – and is still collecting contributions for the project. “Members wanted to complete a project that would be a visible, lasting legacy and gift to the people of the city of Youngstown,” Schulick said. In addition to its other philanthropic and community service endeavors, Rotary has a history, nationally and internationally, of supporting and enhancing parks, including projects in Boardman Park in Boardman, Fair Park in Canfield and Yellow Creek Park in Struthers undertaken by those communities’ respective clubs, he said. Youngstown Rotary received $50,350 from the Hine Memorial Fund of the Youngstown Foundation to support the accessibility upgrades. The foundation itself also awarded $25,000 for the project from its unrestricted fund, said Executive Director Jan Strasfeld. Renovations to the pavilion included installation of a new roof, windows, gutters and heating/ventilation/cooling system, lighting upgrades and improved access for people with disabilities, said Sharon Letson, executive director of Youngstown CityScape and project manager for the pavilion renovation. “Once you start, you see a dozen other improvements, what we need to do next,” Letson said. “I see these renovations as more of a solid foundation and a starting point for our future work rather than a totally completed project. “Whenever you embark on a project and you have a great team, this is the kind of result that happens,” Letson added. She praised the various community leaders and participating organizations, including general contactor Adolph Johnson & Son Co., Mineral Ridge, and architecture firm Faniro Architects Inc. in Youngstown, particularly architect Frank Rulli. 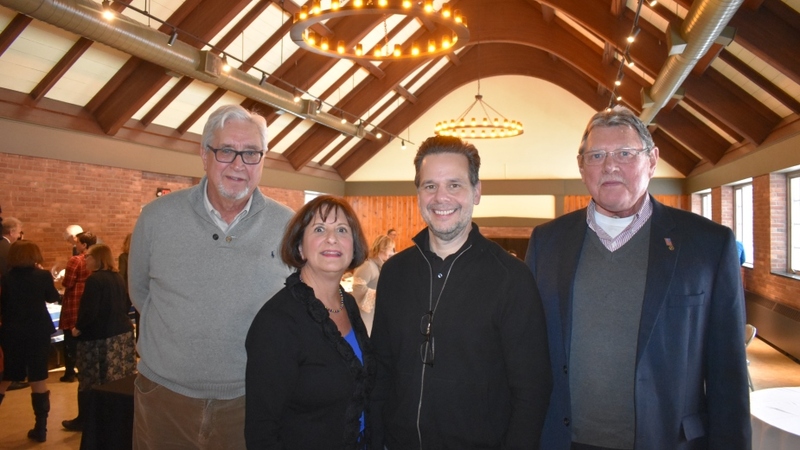 (From left) John Fahnert, Rotary president, Sharon Letson, executive director of Youngstown CityScape, Frank Rulli, senior associate at Faniro Architects, and Paul Johnson, president of Adolph Johnson & Son Co., were on hand for the event. “Whenever you do a renovation, the biggest challenges are the things that you can’t see when you start, the things that get uncovered,” Rulli said. With the pavilion project, that included unanticipated restroom issues and steam pipes that had to be moved, he said. “The hardest part is we were on a budget and we had to make decisions,” Letson said. “They weren’t always glamorous decisions but we had to spend our money as wisely as we could.” Among the future upgrades Letson said she would like to see are an updated kitchen, landscaping around the building and uplighting for the exterior. Lighting was “a big issue” in the pavilion’s main room, because the existing fluorescent lights were outdated, cold and sterile, Rulli said. In addition to removing the blinds from the room’s windows to accommodate natural lighting and expose “these really beautiful views of the park,” new interior lighting was installed that highlighted the ceiling. “The ceiling is the most important architectural feature of the room. It actually gives a sense of space,” he said. In 1890, the Wick family donated 34 acres of land to the city to develop the park, said Bill Lawson, executive director of the Mahoning Valley Historical Society and another past Youngstown Rotary president. The park reached its “zenith” with the construction of the pavilion, which was dedicated in 1955, he said, and is among the most often used and reserved facilities within the city park system. Mayor Brown, who witnessed the renovation in process, said he was “in awe” of the building’s transformation and thanked the Rotarians for their efforts. “We’re not just renovating a building. We’re going to renovate the community, and it starts with projects like this,” the mayor said. John Fahnert, current Youngstown Rotary president, took the opportunity to promote the club’s newest fundraiser. The inaugural Groundhog Day Craft Beerfest will take place Feb. 2 at Stambaugh Auditorium. Tickets, which went on sale Wednesday for the event, are available at the auditorium website. Pictured above: Scott Schulick, past president of the Youngstown Rotary, addresses those gathered at Wednesday’s event at Wick Park Pavilion.